handcrafted furniture. We suggest it for guests looking for relaxing days in their tour of northern Sardinia, not far from the area’s towns and beaches. An oasis of peace and relaxation in the countryside around Alghero in the north-west of Sardinia. Alghero is also known as “Barceloneta”, or little Barcelona, thanks to its Catalan origins which can be seen to this day in its traditions, dialect and cuisine. The town of Alghero is just 14 km from Inghirios, while the airport is a mere 3.5 km away. Women, and in particular Sardinian women, are at the very heart of the philosophy of Inghirios with its welcome culture based on the concept of hospitality so typical of the women of the island: welcoming guests as they would be welcomed into their own homes. With their arms wide open. The word “Inghirios” in Sardinian actually refers to the concept of embracing. And women are placed not just at the centre of the resort’s philosophy, but also at the centre of its design. Inghirios has a central building and an annex, both surrounded by the greenery of a fragrant Mediterranean garden full of citrus trees and medicinal herbs. A “Sunset Corner” has been set up on top of a small hill looking out to the west. The hotel offers six standard rooms and five superior rooms, all decorated in traditional Sardinian style. The room rate includes access to the wellness centre and Wi-Fi. Standard rooms are located on the first floor of the main building (n°.5 Marianna Bussalai, n°. 6 Eleonora D’Arborea, n°. 7 Manuela Loi) and on the second floor in the mansard (n°. 8 Edina Altara, n°. 9 Adelasia Cocco). All rooms have a night area with panoramic window. Superior rooms are located on the first floor of the resort’s central building (n°. 1 Maria Lai, n°. 2 Maria Carta, n°. 3 Pasca Devaddis, n°. 4 Maria Antonia Serra Sanna) or external to the main building (the two annexes - Donna Anna Maria and Donna Grazia). Superior rooms offer a night area, loft with relaxation area and a veranda overlooking the garden. There are numerous beaches a few kilometres from Inghirios, including Spiaggia di Maria Pia, Spiaggia del Lazzaretto, Spiaggia Le Bombarde, Spiaggia di Porto Ferro, Spiaggia del Porticciolo. The spa takes its inspiration from ancient Roman thermal baths and gives it a modern twist by bringing in the concept of the Mediterranean. The spa is made up of: a wet area (with Turkish bath, Finnish sauna and therapeutic shower with chromium programmes/aromatherapy and slimming); a thermal area (with caldarium, tepidarium, frigidarium, hot Kneipp pool and cold Kneipp pool); and a relaxation zone (a room lit with a starred ceiling where guests can lie back and relax in chaises-longues). Guests at Inghirios can enjoy breakfast in the hotel. The hotel’s staff will be delighted to suggest the best restaurants in the area for lunch and dinner. Inghirios has a pool with sun beds, parasols and a bar surrounded by lush greenery. Free private car park. Horse-riding, boat and land excursions, snorkelling and dolphin-watching are all available close to the hotel. 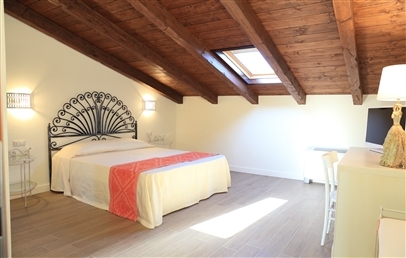 Standard rooms are decorated in traditional Sardinian style and are located on the first and second floor of the resort’s central building. All rooms have an en-suite bathroom and night area with panoramic window. Standard rooms on the first floor are: n°. 5 Marianna Bussalai (double bed or twin beds) n°. 6 Eleonora D’Arborea, n°. 7 Manuela Loi (only available with double bed). Standard rooms on the second floor in the mansard are: n°. 8 Edina Altara, n°. 9 Adelasia Cocco. These two rooms both have a living area. 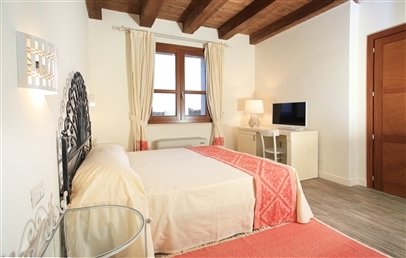 Superior rooms are decorated in traditional Sardinian style and are located on the first floor of the resort’s central building or in an annex away from the main building. Superior rooms in the main building are: n°. 1 Maria Lai, n°. 2 Maria Carta, n°. 3 Pasca Devaddis, n°. 4 Maria Antonia Serra Sanna. Superior Annex rooms are: Donna Anna Maria and Donna Grazia. All rooms have a night area; rooms n°. 1 and 2 also have a loft with relaxation area and veranda that overlooks the garden. A free spa journey per person per day (from 8 y.o. ): thermal pool, sauna, hammam and emotional shower.